Office Space - St Peter Port, . 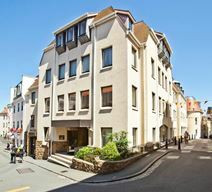 Ideally set in the centre of Guernsey's financial district, this freshly refurbished office centre provides a variety of workspaces for your business. The centre offers a range of business support services. For example, your business can benefit from this centre's dedicated telephone answering, fax and mail management and secretarial services; all of which can give your company a strategic presence.